The best California school websites with website management included. We do NOT offer just another content management software that you or your staff must manage. Those days are gone—or could be. Never need to train another staff member how to update a website. Never have to learn the ever-changing website accessibility requirements. Never have an embarrassingly stagnant school website. Never pay lawyer fees in response to a complaint from the Office of Civil Rights for a website that needs a website audit. Never need to hire a graphic designer, copywriter, or editor. 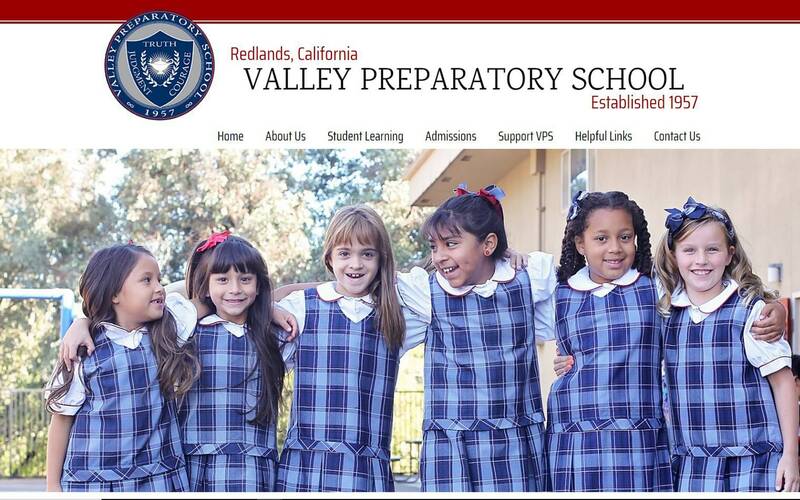 Never need to pay staff to update your school websites. It isn’t as if California schools don’t have enough hoops to jump through, between standardized testing, compliance audits, IEPs, contract negotiations, ADA website accessibility, HR regulations, ever-changing curriculums initiatives, plummeting funding, and mountains of regulations, (and now the CA website certification law), California educators spend more and more time complying with bureaucracy. There must be a better way, right? Actually, there is. Stop expecting school staff to manage your primary communication resource, your school website, as an “other duties as assigned” project. Your website is all about communication. That requires skills like public relations, marketing, copywriting, graphic design, and customer service. Start putting a priority on your communication efforts. Tell your school’s stories. Court those media relationships. Engage your parents. Enthuse your students. Expect outstanding customer service from all of your staff. All of this happens with a focus on strategic school communication efforts. The reality is that most schools can’t afford to hire for the skill sets required (PR, marketing, storytelling, copywriting, graphic design, website accessibility, quality control) to counter the negativity that spreads like an epidemic without effective communication strategies in place. Assigning website management to your IT director, whose expertise is NOT in the area of communication, is NOT the answer. Hiring for those skill sets is the solution. What about hiring professionals to manage much of this for you? Can’t afford it? What if you had a team of work-from-home professionals who left their various careers to start a family and raise their children? What if you could get a fully-managed California school website for $149 per month per site? And, what if that management included website accessibility management, quality control, grammar and spell checks, and best-practice advice to keep your website current and engaging? Need help managing your school social media? Get if for as low as $150 a month. Struggling to get success stories and news gathered to keep your website effective? How about we hire a part-time communications coordinator from your own community (whom we train, manage, and consult with for as low as $16,000 a year) to be focused on your school communication strategies? Does your school need a website audit or document remediation to meet ADA requirements? Yep, we do that too. By partnering with School Webmasters, your school staff will be able to spend more time teaching and leading. We work invisibly behind the scenes, like busy little elves, making your school shine! We understand that switching from a content managed system (CMS) and its DIY website strategy might be different from what you do now. But, check it out, and find out what it takes to move your school toward becoming the school of choice in your area. Be a leader, not a lemming. Just ask a few of our California school partners. They know. They are leaders who put communications to work at their schools—painlessly and affordably. Still not sure you're ready to stand out from the crowd? Subscribe to our blog and continue to get communication and marketing ideas for your school twice a month. Download our free eBook: Creating an Exceptional California School Website and we will enter your name into a drawing for free copy of our Marketing Your School toolkit. Marketing Your School calendar and toolkit is our strategic communications calendar & workbook with more than 50 weeks of easy-to-implement, practical school marketing steps. This comprehensive resource, along with website access to dozens of templates and resources you can immediately put to use, is designed for school principals, secretaries, or anyone else who wants to help improve their school’s reputation. No marketing or public relations experience required. However, if you don’t want to wait to see if you are a winner, order yours today and use the coupon code “success” and get $100 off! If you are really interested in learning about our school website and communication services, give Jim a call at 480.422.8966. Let him tell you how we can turn your school website and school social media into a marketing and public relations machine. If you do, he'll send you one of our $279 marketing toolkits for free! Just tell him you got his number from the California School Websites page! Pretty cool gig, right?